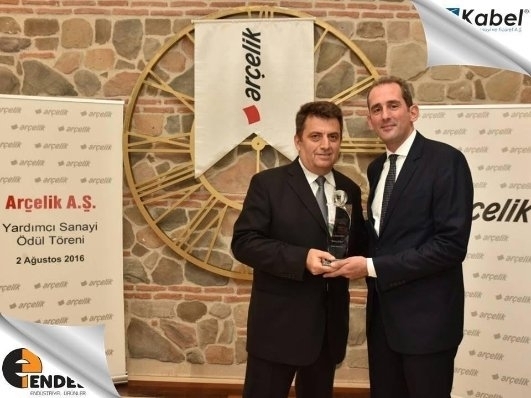 ARÇELİK Supplier Performance Award, 2015 organization took place in Divan Hotel attending with Oğuzhan ÖZTÜRK Vice General Director of Production and Technology, Polat ŞEN Vice General Director of Financial Affairs, Emin BULAK Director of Purchasing and ARÇELİK Executives; 11 Suppliers Representative having awarded on the 2nd of August,2016. In the ceremony, 11 rewards seperated into 2 categories as Merit Pay and Private Award. Ş. Burak ÖZAYDEMİR Vice President of ENDEL Group of Companies has been awarded on the behalf of KABEL Kablo is member of ENDEL Group. New ClioV, rearlights cabled by Kabel A.S. !!! Another task is completed. Re-Certification of IRIS with a new name : ISO/TS 22163:2017. Marry Christmas! We wish you a saccessful and healthy new Year. Die Besten wünsche zum weihnachtsfest und ein gesundes neuses Jahr! We attended,EURASIA RAIL-2017 6th International Rolling Stock,Infrastructure & Logistics Exhibition, the world's 3rd biggest railway exhibition, that brings together the government bodies and private sector. ENDEL attended industry leading fairs such as IFA-Consumer Electronics, Innotrans-Railway and Transport Technology and IAA-Commercial Vehicles in September,2016. We thank all the visitors and customers for visiting our booth. We hope you thoroughly enjoyed your visit and our hospitality. The exhibitions were great success for ENDEL Group and gave us the opportunity meeting new business contacts in the future. KABEL Kablo will attend IFA fair which will be organized in BERLIN on the date of between 2-7th September, 2016 is official partner of the future since 1924. Hopefully, you may visit our stand in "TURKISH Household Appliances Suppliers" Pavilion in Hall27, Stand 260. Thanks in advance for your cordially visitation. We would like to thank you on behalf KABEL Kablo - a member of ENDEL Industrial Products Group. It was our pleasure meeting you at our stand in IFA 2015. Thank you also for the interesting conversation and your time spent with us. We hope to have a long term business and friendship in the future. "SUBCON TURKEY" is most commonly followed up Subordinate Industry and Supplier journal in Turkey published in October, 2015 that Turkish White Good Subordinate Industry created tremendous impression in IFA 4-9 September, 2015, also interview belongs to Messrs. Şeref Burak ÖZAYDEMİR who is both Vice Chairman of ENDEL Group of Companies and Vice Chairman of BEYSAD has had journal coverage. In this interview, Özaydemir assessed that National Participation to IFA fair which was organized as first in 2015, and then he shared his thoughts including necessity of emphasizing Turkish Pavilion. 3rd of Supplier Awards in this year, given by ARÇELİK Group that holded a ceremony in Beyoğlu Divan Brasserie on the 12th of June. In assessments, there are several capabilities were considered such as quality,logistics,corporation and financial proficiency. Bronze Globe Performance Award was given to KABEL Kablo A.Ş.by Purchasing Managers of ARÇELİK Group. We attended,EURASIA RAIL-2015 5th International Rolling Stock,Infrastructure & Logistics Exhibition, the world's 3rd biggest railway exhibition, that brings together the government bodies and private sector. We attended MESSE Industrial Supply Fair between dated on April 13-17, 2015 in Hannover,GERMANY. We would like to thank all visitors that visited our stand ,viewed our products and present their valuable opinion and suggestion. KABEL Kablo Elemanları San. ve Tic. A.Ş. was considered worthy to third prize for "Electric Conductors Fitted with Connectors" by Istanbul Minerals and Metals Exporters' Associations in 2014. We will attend to Hannover MESSE-2015 between 13-17 April as KABEL Kablo Elemanları Sanayi ve Ticaret A.Ş. and we are certainly sure that your participation will make us honored. You are welcome to join us at our booth. We attended International Trade Fair for Electronic Components,Systems and Applications Messe München between dates November 11-14,2014 at Munih,Germany. We attended International Trade Fair Refrigeration-Air Conditioning-Ventilation-Heat Pumps Chillventa 2014 between dates October 14-16, 2014 at Nuremberg,Germany. As Kabel A.Ş. we have attended B/S/H/ 2014 Supplier Day in Munich by 06.10.2014. This activity is organized every two years and only 29 suppliers of B/S/H/ from 2400 global suppliers are invited as candidates ,in consequence of performance and strategical scoring. We, Kabel A.Ş., have awarded as The Best Supplier in Electrical Components Category in B/S/H/’s global suppliers and we feel joyful about laudableness from our one of the strategical customer. Kabel Plant is awarded by IMMIB as being one of the Export Leaders in ” Electric Conductors Fitted With Connectors” sector, on 19.02.2014. You are welcome to join us at our booth!